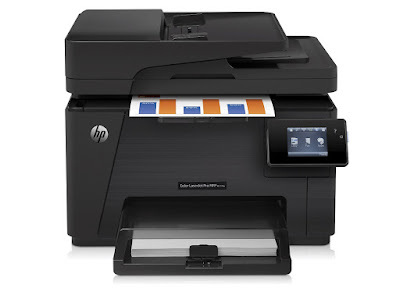 HP Color LaserJet Pro MFP M177fw is an affordable HP Color LaserJet Pro MFP brings vibrant color printing in-house, and boosts productivity with Ethernet connectivity. Enable easy printing at work, home, or on the go with mobile printing features. ; Print speed: Black: Up to 17 ppm; Color: Up to 4 ppm; Scan resolution: Up to 1200 x 1200 dpi (hardware); Up to 1200 x 1200 dpi (optical); Copy resolution: Up to 600 x 600 dpi black (text); Up to 300 x 300 black (graphics); Up to 600 x 400 dpi color (text and graphics); Display: 3.5 LCD (color graphics); Standard connectivity: Hi-Speed USB 2.0 port; built-in Fast Ethernet 10/100Base-TX network port; Wireless 802.11b/g/n; Duty cycle: Up to 20,000 pages; Impress with professional color-show your best work with vivid documents and keep black printing costs low; Hit the ground running. Get started fast with HP Smart Install; Go from zero to the first print out in a matter of seconds. ; Speed through document tasks. Set the pace for success with an MFP that prints, copies, and scans; Print from virtually anywhere with Apple Air Print; Print from your mobile device with built-in print capability or the HP reprint app and software; Simplify copying-quickly capture two-sided documents in fewer steps. 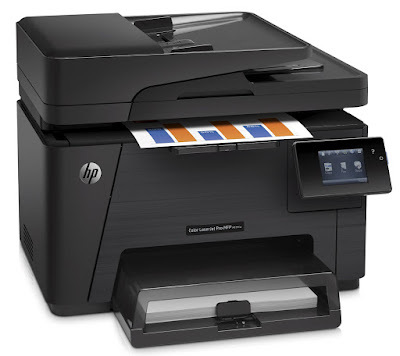 Accelerate your office tasks with the HP Color LaserJet Pro MFP M177fw. Print, scan, and copy in vibrant color and send faxes. Get more done with a wireless device that keeps you connected to printing, from anywhere in the office or on the go. Save on space with a compact, color MFP that easily fits in small spaces. Share this compact MFP via Ethernet and wireless connectivity. Easily print from your smartphone or tablet. Stay efficient with a 35-sheet automatic document feeder, a 3 inch color touchscreen and document management apps. Make one-sided copies of two-sided IDs with ease. This HP Printer is compatible with Windows 10 (printer driver update may be required). Up to 17 ppm black, up to 4 ppm color. Print/Scan resolution: 600 dpi/1200 dpi. Designed for work teams with 1–5 users. Print speed black: Up to 17 ppm. Print speed color: Up to 4 ppm. First page out (ready): As fast as 16 seconds black, as fast as 27.5 seconds color. Recommended monthly page volume: 250 to 950 pages. Paper handling input, standard: 150-sheet input tray, 35-sheet automatic document feeder. Paper handling output, standard: 50-sheet output tray. Media sizes supported: Letter, legal, executive, 4 inch x 6 inch, 5 inch x 8 inch, 8.5 inch x 13 inch, envelopes (No. 10, Monarch); custom 3 inch x 5 inch to 8.5 inch x 14 inch. Scan resolution, optical: Up to 1200 dpi. Copy reduce/enlarge settings: 25 to 400 percent. HP M177FW is was easy to setup and come with enough toner for 500 pages of printing. (I'm a 100pages in and have used appx 20% of toner). The color print quality is coulld and at about 250 it is the cheapest multfunction color laser printer I could find. The unit of M177FW is somewhat large and it does take a little time to warm up. Once warm it prints as fast as the inkjet printer it replaced. I not fond of the paper refill tray, it has a plastic cover that gets in the way if not removed when loading more paper. It was super easy to set up and connect wirelessly. I did a couple of test prints and I'm very please with the print. My standards are average, I'm not a printing studio or anything like that so I don't need superior quality or the fastest speed. Some people said it was noisy and to me it's no noisier than other printers I've used (in fact probably less so since my house is pretty quiet and others I've used that are similar were always in an office setting). Everything is great in my opinion and for home use, I'm happy I got this. If you're thinking of getting this for non-commercial/high-volume purposes.